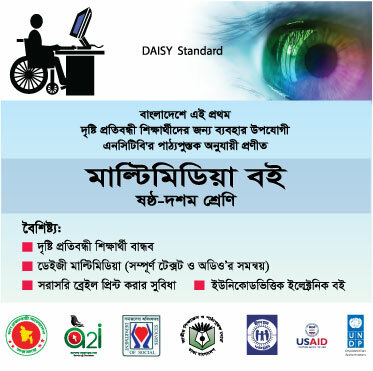 Name of the project: DAISY-Standard Accessible Reading Materials for the students with Visual and Print Disabilities. Beneficiaries: Students with visual disability, print disability, and learning disability of class I – X. 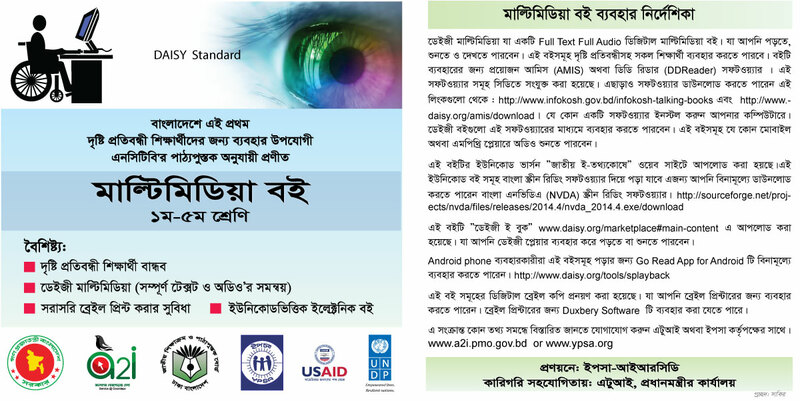 According to the WHO and Bangladesh Government finding, approximately four million people are visually impaired in Bangladesh. Visually impaired students are now studying at school and university level & there is a severe lack of accessible study materials. 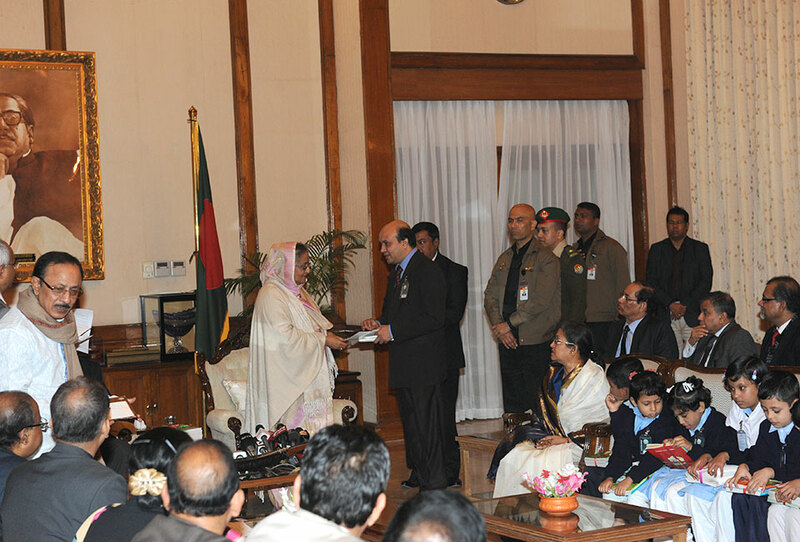 Furthermore, approximately 48% (census 2011) of people in Bangladesh are illiterate or low literate. These large amounts of population can also be considered as print disable. Accessible information has not been available to this group and information rights have not been recognized thus, further barriers created for these print disabled and visually impaired people. Article 17 of the constitution of Bangladesh says about the free compulsory and inclusive education. As a result, lots of visually impaired students are now studying at schools, colleges and universities and this number is going up every year. On the contrary, these students are facing a severe lack of accessible study materials and experiencing discrimination in the field of education. That’s why we are making relentless effort to resolve this problem. Yet they are not getting enough accessible materials, therefore, the drop-out rate of the visually impaired students from educational institution is very. By this project YPSA hopes to fulfill the dream of hundreds of visually impaired boys and girls by availing them with enough accessible study materials. To initiate a process of developing and producing text books in accessible format for the visually impaired students of class I to X through the use of DAISY. disadvantaged groups of students from class I to X.
YPSA, with the support of a2i, Prime Minister Office, has produced DAISY digital multimedia books, Accessible E-books, Digital Braille Books and math books for the student of class I to X which proved much accessible and cost effective than the in accessible paper books for the students with visual disability, print disability and learning disability. This project has transformed all the text books from class I to X, into DAISY digital multimedia format, these contents are further convertible into DAISY full text full audio text books, Braille and accessible e-books from the source DAISY file. It has proved as cost effective, less time consuming and universally designed so that all children can have an easy access to these reading materials all over the country. These books are for ‘everyone’ who needs accessible information and loves to read. Readers can play the audio and simultaneously watch and highlight the corresponding text. In Bangladesh, the system of manual production of Braille book was not efficient in terms of time, cost and volume of production. Therefore, DAISY full text full audio multi-media books, accessible e-books and digital Braille books are being developed for accessibility and education of the students with visual disability, print disability and learning disability of class I-X. Accessible e-books (E pub 3) are being developed that has enabled disability inclusive publication and this has also reduced the production cost by 70%. The multimedia class rooms can now use these DAISY multimedia books for every student. Uploading these digital contents on YPSA website for the wider dissemination is also a new innovation. These books can be downloaded for free of cost by any person in the world. These multimedia contents are easy to use by the intended user groups as presently internet is available all over the country in cheap rate and also an android mobile device is enough for using it, and Android mobile set is also easily available. Besides, DVD’s are being distributed completely for free. Also, any intended user can manage a DVD or mp3 player and play the DVD or downloaded file very easily. Also, different NGOs, DPOs and Community Radios work for PWDs to get these technologies. We have provided DAISY multimedia Books to the students of grade 1-10 who are visually impaired. Besides, every year on January 1, Bangladesh Government distributes these books for free among the students of primary and secondary schools and madrasas across the country to ensure “Education for all”. As these books are also uploaded in online, any visually impaired student can download these books. Students of 5 dedicated schools for the blind and 64 integrated schools are using these books. Student who are out of internet coverage, are using these books either through DVD player, Android mobile or mp3 player. In Bangladesh, total user of DAISY Multimedia Books is around 150,000. We have developed accessible reading materials that has made primary and secondary education inclusive (SDG 4.a), accessible for all girls and boys (SDG 4.1) and also contributed to improve literacy and numeracy among the user groups (SDG 4.6). Today, around 150,000 students with visual disability, print disability and learning disability can read and listen to their textbooks. The government is distributing these books for free, therefore, now all girls and boys can get completely free, equitable and quality primary and secondary education leading to relevant and effective learning outcomes (SDG Target 4.1). This is ensuring that the education facilities are child, disability and gender sensitive and provide safe, non-violent, inclusive and effective learning environments for all (SDG Target 4.a). To convert text books of higher secondary and tertiary education. To convert 200,000 pages of accessible materials (around 1500 titles) on various issues. To establish a National Multimedia Talking Book Library to tackle the gap of accessible materials for ensuring inclusive education. Develop a “Guideline on Accessible Content Development in Bangla” and develop a “Self-learning Online-based Tutorials on Skill Development for Accessible Book Production”. 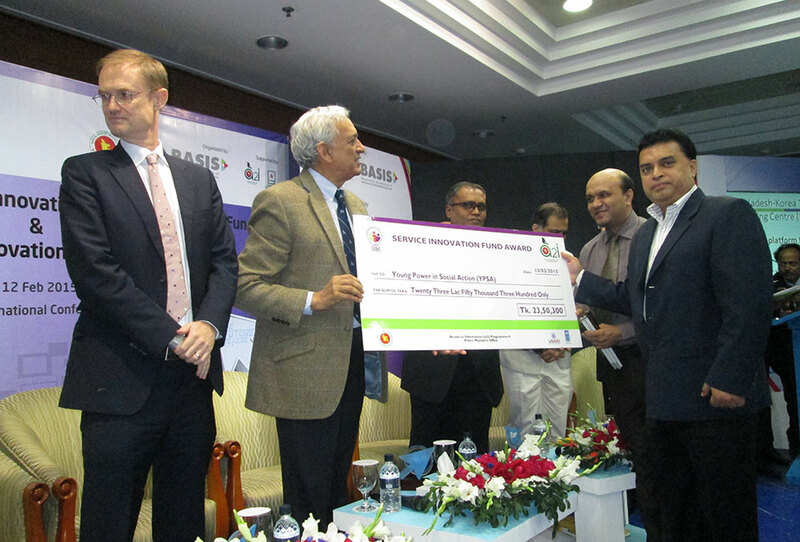 Innovation Grant by access to Information program (a2i) of the Prime Minister Office for DAISY book Production in 2013. Manthan Award South Asia, awarded for DAISY for All in Bangladesh in the e-inclusion Category. 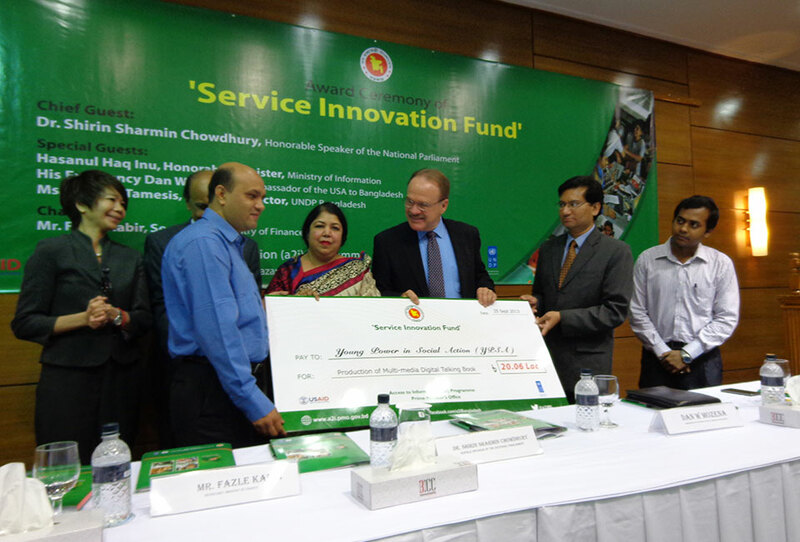 Service Innovation Fund (SIF) Award 2015 by A2I, Prime Minister Office. Accessible Books Consortium Award for Accessible Publishing Initiative at the International Excellence Award 2015 held in London Book Fair (LBF).